Pop Icon Mr. Cold Call� was featured in a previous edition of Investor's Business Daily. The article was called "Be Persistent Work Hard: Warm Up To Cold Calling." Local Coupon Marketing™ Enters Into a Contract Agreement with Mr. Cold Call, Inc. Pop Icon Mr. Cold Call™ wrote the foreword for a new book by E.R. Carpenter entitled: "How to Dominate in Cold Calling and Earn Six Figures Doing It." Click here to read the FOREWORD! 1. What's with that ridiculous lampshade on your head? You look like a buffoon? When you're speaking with your sales prospect they cannot see you. They can only develop a mental image or picture of you by your voice. So for me, the lampshade is symbolic. When you look at me (the buffoon as you call it) it's actually a funny picture, but it show's that I have personality, that I'm fun and enthusiastic. These traits are the same type of traits that you need to convey over the telephone with your prospect. The only way that you will compensate for the fact that you're not face to face with them is by injecting your personality into your cold calls. View the entire Pop Icon Mr. Cold Call Interview! "Everyday our sales prospects are bombarded with messages from everywhere. I'm talking about advertising messages and as a result the only way to get through and win their attention is by being different." Pop Icon Mr. 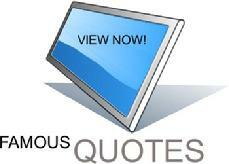 Cold Call� - For more famous quotes click here! FRESH COLD CALLING CONTENT - JUST UPDATED! What Is It Like Making 100 Calls A Day For Six Months? Get More New Business: Download The Sales Generator Workbook! You can learn a lot by not turning on your radio all the time! What You Should You do if Your Prospect Keeps Putting You Off? 80.1% of Your Big Sales Will First Come This Way! 3 New Sales Opener Tips JUST ADDED! "Yeah, it's really too difficult to switch over." "How to Have Fun Cold Calling and Get Your Telephone Ringing Off The Hook!" Where's Your Light Bulb in Your Sales Pitch? Many salespeople follow up by telephone, but is that the best way? The Biggest and Most Common Sales Appointment Mistake Ever! Book - Audios - Videos: Check out the Motivation and Improvement Store! STOP NETWORKING for new business - Use this technique to increase referrals! Use these 10 Sales Ideas and never worry about making your quota ever again! Pop Icon Mr. Cold Call� is a service of Mr. Cold Call, Inc.
You're Sales Manager is NUTS? Give Your Prospect a TOY? 58 Sales Openers that WOW! The Pop Icon Mr. Cold Call Pre-Call Planning Cold Call Script� helps you to strategically plan each stage of the sales process from "Attention-Getting" Sales Openers to Asking Engaging Questions to Overcoming Sales Objections to Closing Sales Questions to Leaving Voice Mail Messages for your sales prospect. The time is now to super-charge your sales success! Pop Icon Mr. 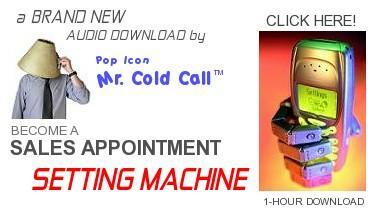 Cold Call� - #1 source for the most cutting-edge cold call technology! FREE Pop Icon Mr. Cold Call� Downloads - Create More Sales TODAY! and is known by sales professionals on virtually all 7 continents! Free Audio, Video & Tips!